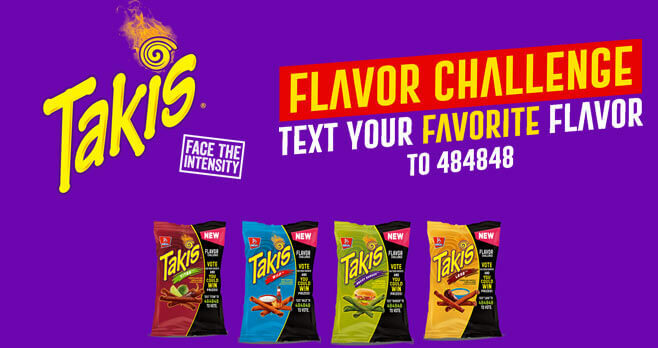 Vote for your favorite flavor during the Takis Flavor Challenge Instant Win Game and you could win prizes. Text “TITAN”, “WILD”, “BURGER”, or “LAVA” to 484848 to vote. The Takis Flavor Challenge Instant Win Game. The Sweepstakes starts on September 1, 2018 at 12:00 a.m. CT and ends on December 31, 2018 at 11:59 p.m. CT. Limit one game play per person using only one mobile phone number per day, regardless of method of game play. The grand prize consists of a one (1) month supply of Takis, awarded in the form of one (1) case of Takis (20 4 oz bags of Takis per case).